I have made the source code of PicasaLight, the project that I have announced yesterday, available on Codeplex. On that page I will add some more details about how PicasaLight works ASAP. Last March or April, when Silverlight 2 beta 1 had just been released, I had an idea. Why not building a Silverlight application for this website that automatically fetches my photos from Picasa Webalbums and displays them on this site? I started building it and encountered many problems, but some things worked, so I kept trying. Before this project was finished, beta 2 was released. Of course, everything stopped working. I restarted building it, but bugs crept in and I never got it the way I wanted it to be. In October, Silverlight 2 RTW was released, and everything stopped working again. Update (28 nov): Version 1.1 is online, there is now an animation when a big photo is loading and I have added a next and a previous button. At TechEd, I was one of the happy few who got their hands on a token for Windows Azure, or at least for the mesh part of it (see screenshot). If you want to learn more about writing applications for Live Mesh, you should read Katrien’s blog. If you hurry you might even get a token too. If you’ve already got a token: here is the place to redeem it. This afternoon I have done a presentation on TechEd and on Windows 7 at Ghent University. I am very pleased with the fact that almost 40 people showed up, because I didn’t expect that many people would delay lunch to see Windows 7 in action. As I’ve already written, last week I have been at TechEd Developers 2008 as an MSP (Microsoft Student Parner). There has already been blogged a lot about TechEd, so I’ll only add something about the MSP-only events. • Kurt Claeys - I won Speaker Idol at TechEd EMEA Barcelona! The MSPs had two special meetings: a social meeting on Tuesday night and a more formal meeting on Thursday afternoon. The social event took place at Barcelona Indoor Karting and it was a lot of fun and a great chance to meet student partners from all over Europe. The meeting on Thursday was very interesting too. Caroline Philips (Microsoft Academic Lead for Western Europe) and Andrey Terekhov (Microsoft Academic Lead for Central & Eastern Europe) did the introduction. Leandro Doeyo (who manages the MSP program worldwide) gave us an overview of the academic programs and Holly Petersen (International Recruitment Program Manager) told us some things about Microsoft Recruitment & Internships. After the break David Chappell teached us how to give a killer presentation and some MSPs from five countries (Poland, Holland, Spain, …) told us about what they are doing to make a difference. Some pictures of my first day at TechEd are available here. I'll be blogging more about TechEd when I get home. Finally we got rid of "downloads.channel8.msdn.com", the website of Dreamspark has been redesigned and is now available on: dreamspark.com. Students of Ghent University (UGent) will soon be able to verify that they are eligible using their student ID credentials (username and password). Both the university and Microsoft have promised me to get it working as soon as possible. I'm happy to announce that I have been selected as one of the four Belgian Microsoft Student Partners who will be attending TechEd Developers 2008. This event will take place in Barcelona, 10-14 November 2008. For the third time I have written an article for Microsoft .Net Magazine. This article is all about novelties in the second beta of Silverlight 2 and it has been published in the September 2008 issue. The text is available on msdevmag.com and as soon as I've got permission I'll publish it on this website as well. As you can see the cover of the magazine has changed. Actually the entire magazine has changed quite a bit: the cover, the layout and last but not least, the publisher. .Net Magazine is now published by Array Publications. There's now an entire team at Array responsible for the magazine and their goal is to take it to the next level: deliver better content, but still for free! Array is still working together with Microsoft on the content. Now that the holidays have started, I’ve got some time to update this blog. First of all, yesterday I have finally received my diploma of secondary school. Next year I am going to study informatics at Ghent University (Belgium). Secondly, I’ve updated the website, my latest article is now online too and the source code of the examples is available on this website as well. There’s more to come as soon as I have worked around some Silverlight 2 (beta) bugs. 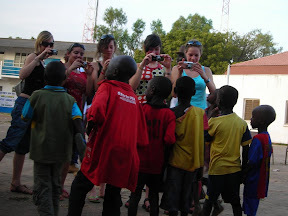 And last but certainly not least, I have not yet blogged about my trip to The Gambia (West Africa). So, in February, I have been a member of my school’s delegation that has visited our sister school in Banjul, the capital of The Gambia. The partnership between schools in Ostend and schools in Banjul is part of the partnership between these two cities. Other collaborations include hospitals and both town halls. During my stay in The Gambia, I have met a lot of nice people and I have had a lot of interesting conversations. If you would like the pictures to tell their story: click here or watch the slideshow. Hello again, today I’m trying to download the latest Microsoft developer tools from Microsoft DreamSpark. DreamSpark allows students to download some software for free (more info here). Luckily I’m very enthusiastic about the concept of giving software away for free to students, because this surely isn’t the best download experience I’ve ever had. First things first, the verification procedure wasn’t that straight forward. If you’re lucky, your school or university participates in the DreamSpark program. In that case, you can use your student ID credentials (e.g. user name and password) provided by your school. Actually, a lot of schools are already participating (in Belgium too). If you aren’t lucky (like me) you will have to prove you’re an eligible student in another way. You will have to buy an ISIC card, an International Student Identity Card (something about eligibility for these cards: here). In Belgium you can get such a card at Connections (a travel agency for students) for 9 Euros. When you finally are a verified student you can start downloading software and get your license keys. Getting a license key works fine. Downloading your ISOs can be done in two ways, with your browser (certainly not recommended for a multiple gigabytes download) or with a download manager. Not the download manager of your choice, but an ActiveX control of their choice. I simply do not like it! The download speed was the biggest problem I had when I started writing this post (it was downloading at less than 200KBps), but now it’s running at 400KBps so I will be able to try VS2008 today! Overall, DreamSpark is still a fantastic project, but a few little changes to the website would certainly improve the user experience! Microsoft announced an unprecedented software program that they believe will help change the lives of millions of students around the world. The program, Microsoft DreamSpark, is focused on providing millions of college and high school students with no-cost access to the latest Microsoft developer (i.e., versions of Visual Studio, XNA Game Studio), designer tools (Expression Studio) and Microsoft platform resources (i.e., versions of Windows Server and SQL Server). Microsoft believes in the power of technology to transform education, and Microsoft DreamSpark is another avenue to help the next generation of young leaders seize the opportunity to harness the transformative ability of software. It’s their hope that Microsoft DreamSpark will help students tap into their creative potential and set them on the path to academic and career success. Currently, the program is accessible by college students in 11 countries including: Belgium, Canada, China, Finland, France, Germany, Spain, Sweden, Switzerland, the United Kingdom and the United States. In the coming months, the Microsoft DreamSpark team will expand the program’s reach to include high school students and to increase the number of participating countries. What free software products are offered? All following software will be available via download. Software bits may be shared between students to reduce the need for each student to download their own bits. However, license keys will be single-use only and must be retrieved online by each student.